The procrastination has gone on long enough! It's time to publish my next installment of Merckx team bike frames. Let's go! 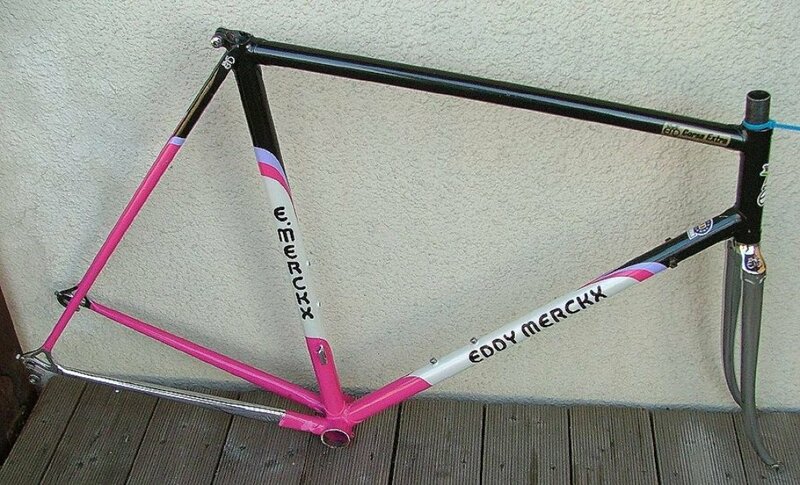 Telekom used Merckx frames from 1991-1995. The above is the color scheme I most associate with Telekom -- you can see it in this team photo from 1994. What you might not know is, in 1995, Telekom changed its name to Team Deutsche Telekom, and changed its bike color scheme to the one you can just make out in this picture of a young Jan Ullrich. Its a pink head and top tube, with purple points. Its more or less as if they flipped the colors on their previous scheme, and called it new. At least they didn't have to change their jersey colors. They shifted to Pinarello frames in '96, so this color scheme only lasted a year -- so if they were available to the public, it would have been a pretty short time frame. OK, its Kelme time. Given how long Kelme was around, you'd think I'd have seen more examples of bikes in the public sporting Kelme colors, but you'd be wrong. In early years, Kelme rode an all white frame, as seen here, as well as a all blue frame, as seen here. In 1985 and/or 1986, Kelme used the same red/pink/white frames that Lotto and Teve Blad did, as seen here. In 1987, they switched to what I think is a pretty awesome color scheme, seen here, that matched their jersey's perfectly. I think they kept this frame through 1989. At some point, for reasons I can't fathom, they switched to this color scheme. The switch was in either 1990 or 1991...I can find pictures in this scheme that I'm sure are 1991, but I haven't found any good shots of a rider on one wearing the Kelme/Ibexpress jersey from 1990. Anyhow, the color scheme looks a lot like Telekom, but with a green bottom bracket and rear triangle. Its fine, but its no '87-89 color scheme if you ask me. Not that you did. Next team post will cover the 7/11, and two of the last pro teams that Merckx sponsored on steel, Motorola and Gan. Here's a thread about my TSX which is startlingly similar to the one in your blog's photo. Love your blog. Don't forget that Telekon grew out of the Stuttgart team, which also road Merckx frames.